Plans by the Ministry of Defence (MoD) to rethink the disposal of radioactive waste from 27 defunct nuclear submarines have come under fierce fire from campaigners. A recent meeting of local authority advisors was told that the MoD is “considering alternative options for the management of the waste”. This is despite previous decisions made after an exhaustive, 16-year public consultation process. Those who were involved in the consultations are alarmed that the MoD is thinking of changing what has been agreed – and are pressing for more information. It was “incredibly frustrating”, said one critic. Since the 1980s seven aged nuclear-powered submarines have been taken out of service and laid up at the Rosyth naval dockyard in Fife. Since the 1990s, thirteen more have been laid up at Devonport naval dockyard in Plymouth, nine of them still containing radioactive fuel. 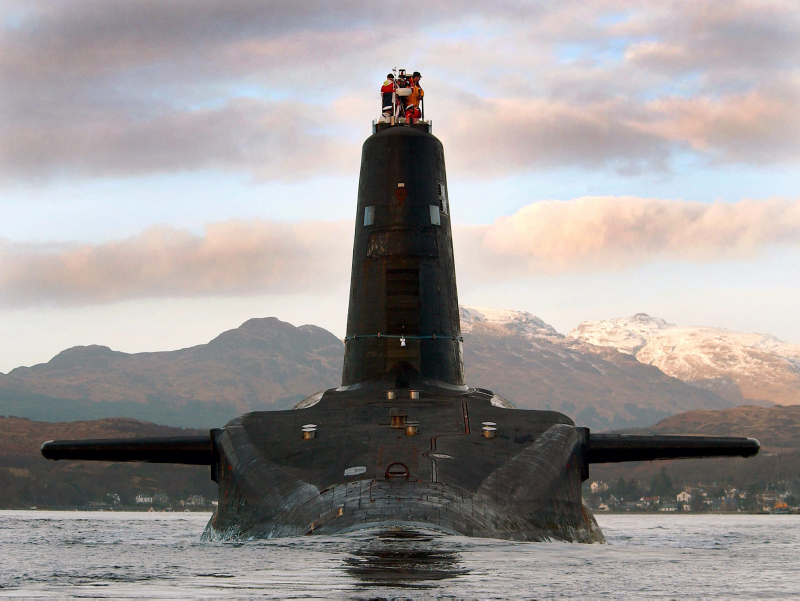 A further three reactor-driven submarines are due to be retired in the next few years. They will be followed by the four Vanguard-class submarines, currently armed with Trident nuclear missiles and based at Faslane on the Clyde. The MoD began a public submarine dismantling project in 2000. It announced in 2016 that a nuclear plant at Capenhurst in Cheshire had been chosen as an “interim storage site” for radioactive waste. A proposal to store the waste on a former nuclear site at Chapelcross near Annan in south west Scotland was rejected after objections from the Scottish Government. The Ferret revealed in December that in the past the MoD has contemplated dumping the submarines on the seabed near Scotland. Work on dismantling the first “demonstrator” submarine, Swiftsure, began at Rosyth in 2016. The MoD said in December 2018 that over 70 tonnes of radioactive and non-radioactive waste had been removed, and that dismantling of a second submarine, Resolution, would start in 2019. But now future plans have been thrown into confusion by the MoD reportedly having second thoughts. The change of heart was disclosed by the Nuclear Legacy Advisory Forum (NuLeAF), an expert group working with 113 local planning authorities in England and Wales. A report posted online for a steering group meeting on 20 March outlined NuLeAF’s role in previous submarine dismantling consultations. “The Ministry of Defence, working with the regulators, has now indicated it is considering alternative options for the management of the waste,” it said. NuLeAF suggested that one option under consideration might be to store some radioactive waste at the Sellafield nuclear complex in Cumbria. It added that a contract worth £3 million a year had been signed to store waste at Capenhurst, but none had yet been delivered. Neither the MoD nor the UK government’s Nuclear Decommissioning Authority would say anything about what “alternative options” were being discussed. The 50-strong group of Nuclear Free Local Authorities (NFLA) is now seeking an urgent explanation of what’s being proposed. NFLA is “frustrated at the general lack of openness and transparency,” said a statement. NFLA Scotland convener, Glasgow SNP councillor Feargal Dalton, blamed “real weaknesses” in MoD processes. NFLA was “highly frustrated” with the delays in resolving what to do with submarine nuclear waste, he said. Campaigners have reacted angrily. “Given the amount of time, effort and public money that went into the consultation process, it is alarming to hear that the MoD now appear to be changing its mind,” said Jane Tallents, who was an advisor to the MoD’s submarine dismantling project. Edinburgh-based nuclear consultant and critic, Pete Roche, accused the MoD of undermining its prolonged public consultations. “Communities and environmentalists thought the MoD had pulled off the impossible and come up with a consensus on what to do with nuclear waste from submarines,” he told The Ferret. In January a group including former naval staff campaigning to “Save The Royal Navy” described the failure to promptly deal with submarine waste as “a national scandal”. Progress had been “painfully slow” because “successive governments have avoided difficult decisions and handed the problem on to their successors,” it argued. An article on the group’s website warned that maintaining the submarines safely while they awaited dismantling was “a growing drain on the defence budget”. It estimated the total cost of disposing of 27 submarines to be at least £10.4 billion over 25 years. The MoD did not respond to questions about the alternative options under consideration. “There are no changes to our plans to use Capenhurst to store submarine intermediate level waste,” said a spokesperson. “We remain committed to the safe, secure and cost-effective defueling and dismantling of all our nuclear submarines as soon as practicably possible.” Dismantling work would be carried out at Rosyth and Devonport dockyards, as the MoD had previously announced. The Nuclear Decommissioning Authority also declined to answer questions about what was being proposed. “I’m afraid your questions are best directed at the MoD,” said a spokesperson. Cover image thanks to the Ministry of Defence.